Trieste, 25 June 2015 – “Carnival Vista”, the new flagship of the Carnival Cruise Line’s fleet, brand of the Carnival Group, the world’s largest cruise ship operator, was launched today at Fincantieri’s shipyard in Monfalcone. Interior fittings will now begin, leading the ship to its delivery, scheduled in spring 2016. The launching was introduced by the traditional and well-wishing “coin ceremony”, consisting, according to an ancient shipbuilding custom, in welding a silver dollar on the last deck of the ship. Godmothers of the ceremony were Heidi e Kye Heald, respectively wife and daughter of John Heald, Brand Ambassador of Carnival Corporation. The ceremony was attended by Benoit Clement, Vice President New Builds and Refurbishment of Carnival Cruise Line, while Fincantieri was represented among others by Gabriele Cocco, Senior Executive Vice President Merchant Ships Business Unit, and Attilio Dapelo, Director of the Monfalcone shipyard. With the construction of “Carnival Vista”, Fincantieri consolidates its leadership in building the largest passenger ships in the Italian shipbuilding history. 133,500 gross tons and 321 meters long, these are the dimensions of “Carnival Vista”, the largest ship which Fincantieri has ever built for the Carnival Cruise Line’s fleet. It has 1,967 passenger cabins, 785 for the crew and it is able to accommodate more than 6,400 people onboard, including the staff. 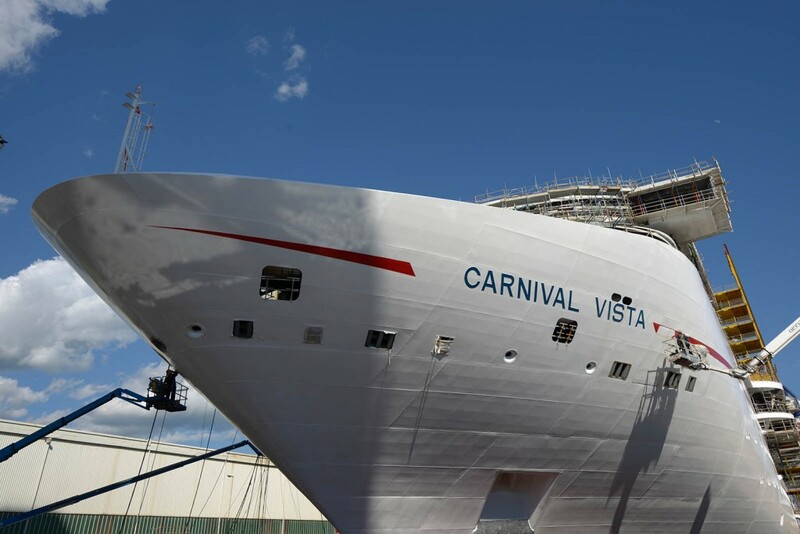 “Carnival Vista” will be a new technological benchmark, in Europe and worldwide, in terms of cutting-edge layout, extremely high performance and high quality technical solutions. The interior fittings will be of an extremely high level quality comfort, offering a wide range of onboard entertainments, such as an IMAX 3D cinema, a brewery (with onboard beer production), restaurants, theatres, shops and wellness centers. One of Carnival Vista’s innovation will be the Havana Area, a themed private and exclusive area, with cabins, open bars and a swimming pool. The access to this area is limited only to those passengers whose cabins are in the Havana Area. Fincantieri has built 70 cruise ships since 1990 (of which 47 from 2002) and other 14 ships are currently being designed or built in the Group’s yards.